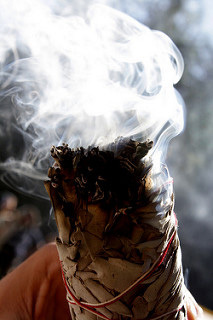 Smudging is the practice of cleansing something with the smoke of an herb. It removes negative energy and helps clear away emotional baggage. It�s a common practice for tarot readers to regularly cleanse their tarot cards and related tools (tarot bags, reading area, spread cloths, etc). Many also smudge their entire homes or reading space. It�s a relatively simple process, and there�s no one �right� way to do it. The most powerful aspect is your intention and the act of focusing your will on the idea of cleansing and renewal. After smudging, most people feel lighter and experience a sense of refreshment and peace. The most commonly used smudging herb is white sage, though desert sage and other herbs such as cedar or sweetgrass, or a combination, may be used. While sage is the preferred smudging tool, you can even use your favorite incense. Lavender, copal, and other herbs are sometimes added to attract positive or protective energy. These herbs are sold in dried bundles, usually called �smudge sticks�, which smolder after being lit just like incense. The smoke that rises from the smudge stick is then wafted around the object you wish to cleanse. The cleansing process is quite simple. You may cleanse your entire home, just your tarot tools, the room in which you read, or any combination of these. In either case the cleansing should take place during the daylight hours, if possible. Open as many doors and windows as you can, or just those in the room where you are smudging. This will allow the negative energy an easy exit route. Start with the main entrance to your home. This isn't necessarily the front door, but the entrance that is used most often. Light your smudge stick by holding it over a flame, and then gently blow on the lit end to make it smolder. Keep a lighter with you to relight the stick as necessary. Focus your will on the idea of cleansing and renewal. Some like to say a brief thank you to the herb for helping you or a prayer of gratitude. Smudge the door by wafting the smoke all around the door frame in a counterclockwise motion to dispel bad energy. Moving counterclockwise through your house and each room, smudge the entryways just like you did at the main door. Many people just smudge doorways and windows. Others also include mirrors, reflective surfaces, and even electrical outlets, all of which are thresholds and thus entry points for energy. Once you've made your rounds, return to your main entry and smudge it again. Here you can say a prayer or an affirmation, or invite positive energy into your home. Extinguish your smudge stick in a heat safe container, like a ceramic dish or ashtray. Just stub out the lit end like you would a cigarette. You may prefer to let it burn out on its own, which most smudge sticks do anyway. The final step is to ring a bell, or make a chiming sound by clicking a spoon against a glass. This sends a vibration of sound energy through the space, bringing everything into harmony. Smudging guarantees you have a way to �reset� the energies in your home or your tarot cards, and can be done as often as you like. Readings can reveal some really nasty things, and smudging helps dissipate this negativity before you read again. Some tarot readers smudge their tools and reading area between each session, while others make it a weekly or monthly practice.